Track ISO 14001 and OHSAS 18001 Compliance Obligations. Manage responsibilities and keep centralized records. Monitor environmental, health and safety legislation in around the world. 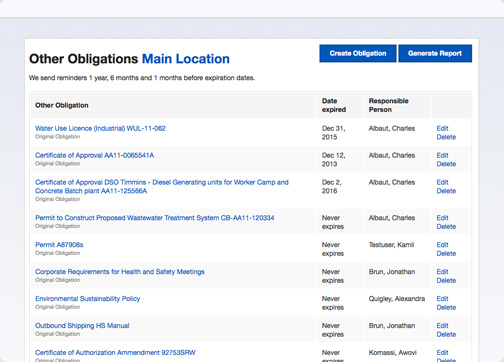 2Sort obligations by Industry, Topic, Document Type and Equipment. Get it validated by a professional. 4Receive Tasks about new and changed requirements. Assign responsibility to a team or person and track their revision. 5Managers can see complete action history, generate reports, add new items and institute procedures to ensure compliance. Issue action items to responsible people. From the Tasks panel, you can assign a responsible person and they can review the change. Your team leaves a note and Nimonik logs the date and time, creating a rigorous paper trail of your compliance efforts. With our Tasks panel you can dive into legislative changes, consult our easy to understand explanations and dive into the source material. 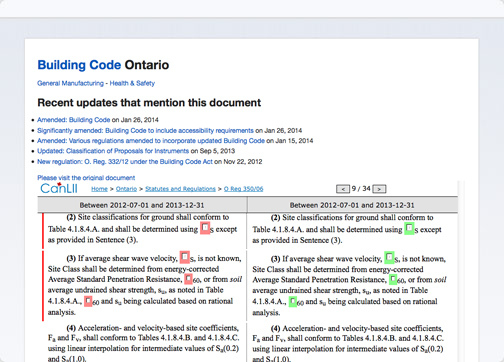 Compare section by section, or navigate to source material on the government website. Pick and choose the legislation that matters to you. Environmental, Health and Safety legal compliance shouldn’t be hard or risky. Take your existing compliance obligations or let us help you pick and choose important legislation that matters to your team. 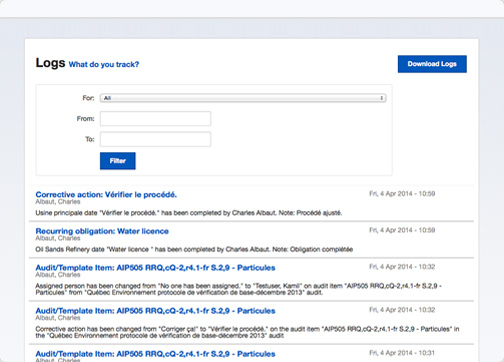 Receive targeted updates and manage internal changes to your operations, ensuring you are compliant all the time. Never forget another reporting deadline. With our tools, you can manage permits, certificates of authorization and identify corporate requirements. Easily create recurring tasks, set responsible people and follow up to ensure everything is filed properly and on time. Synchronize these important dates with your Outlook calendar. Demonstrating compliance requires evidence. When the external audit comes, you’ll be ready. 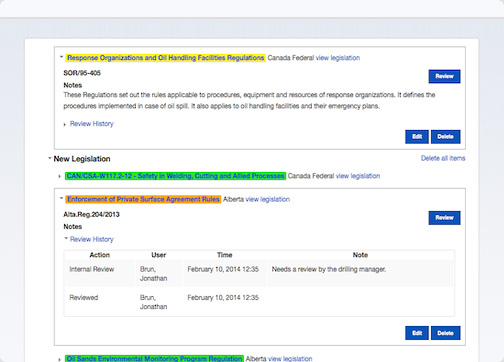 With Nimonik, you build up a detailed history of your legal compliance efforts, reviews and actions taken. All information is available at the click of a button.